PlayStation, officially abbreviated PS) is a series of video game consoles created and owned by Sony Interactive Entertainment. The brand was first introduced on December 3, 1994 inJapan with the launch of the original PlayStation console. It now consists of four home consoles, as well as a media center, an online service, a line of controllers, two handhelds and a phone, as well as multiple magazines. The original console in the series, the PlayStation, was the first video game console to ship 100 million units, 9 years and 6 months after its initial launch. 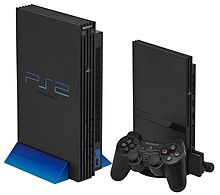 Its successor, the PlayStation 2, was released in 2000. The PlayStation 2 is the best-selling home console to date, having reached over 155 million units sold as of December 28, 2012. The first handheld game console in the PlayStation series (called the PlayStation Portable, or PSP), sold a total of 80 million units worldwide by November 2013. Other hardware released as part of the PlayStation series includes the PSX, a digital video recorder which was integrated with the PlayStation and PlayStation 2, though it was short lived due to its high price and was never released outside Japan, as well as a Sony Bravia television set which has an integrated PlayStation 2. The main series of controllers utilized by the PlayStation series is the DualShock, which is a line of vibration-feedback gamepad having sold 28 million controllers as of June 28, 2008. The series also has a strong line-up of first-party titles due to Sony Interactive Entertainment Worldwide Studios, a group of fifteen first-party developers owned by Sony Interactive Entertainment which are dedicated to developing first-party games for the series. In addition, the series features various budget re-releases of titles by Sony with different names for each region; these include the Greatest Hits, Platinum, Essentials, Favorites (this in Latin America) and The Best ranges of titles.